My name is Steve Farrell and I’m a scooter apron wearer. I have visions of myself saying that, standing in front of a room full of people guilty of equally heinous biking fashion crimes, at a support group.
" It all started when I bought a big scooter, " I continue. " I thought I could handle the luggage space, unbeatable weather protection and no gears. But, before I knew it, I wanted more. I started dabbling with top boxes and tall screens. Then I moved on to the hard stuff – panniers, an intercom, a stereo and heated grips. Before I knew it I had an Oxford scooter bag, Baglux bar muffs – and the apron.
" That’s when I realised, as my hands slowly cooked inside the muffs and the apron on my lap flapped in the wind like bat wings, I had a problem. " Owning the Tmax has been a slippery slope. When I went to the MCN Ally Pally Show in January, I already had the tall screen, top box and panniers. But I just got carried away with all the low prices. I felt how warm the Oxford heated grips were and had to have them. Then I saw the Oxford scooter bag, which sits in the footwell, and it was too neat to resist. After that I didn’t know where to stop. I saw the Baglux apron and matching muffs and just thought: Why not? 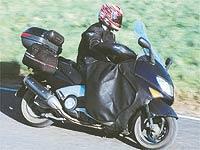 In case you’re wondering, the apron is a piece of heavy-duty waterproof material, with a fur-style lining, which stretches from the front of the scooter, fully covering you from the waist down. Now, of course, I know too well " why not " . The moments of panic when I come to a halt and struggle to get my foot out of the apron and on to the ground before the scooter falls over are why not. The numerous pile-ups I’ve almost caused as drivers gawp in disbelief are why not. And not least, the merciless ribbing from mates is why not. But what finally made me realise I’d been away from proper bikes for too long was when I blagged a ride on a BMW 650 Funduro. I was waiting at the lights. They changed to green and I opened the throttle, noting the big single’s satisfying thump. But it was soon apparent something was wrong. I’d been riding a twist-and-go for so long I’d forgotten proper bikes need to be put in gear. As I sat there, engine screaming as confused drivers manoeuvred round me, I realised I had to get back to basics. Somewhere, among all the luggage, comfort and gadgets, I’d lost a bit of what biking is all about – fun. When I look at the kind of rider I am now compared to the one I was a year ago, I realise I no longer ride for pleasure. It has become purely a way to get around, which happens to be fun occasionally, rather than a leisure activity. Instead of power and weight figures, I find myself comparing bikes based on how many full-face lids fit in them (the top box-equipped Tmax can take three, by the way). Bikes may be great for cutting though traffic, but aside from that they were never supposed to be convenient and practical. They’re supposed to be about freedom, thrills and attitude. That’s what I need to get back in touch with. To be fair, the Tmax has done all I’ve asked of it for a year, and so have all the accessories. I don’t think I’ll ever ride in winter without heated grips again, whatever bike I’m on, though I wouldn’t recommend using them and the muffs together. The Autocom rider-to-passenger intercom, which doubles as an amp for my minidisc player, will also come with me when I get my next bike. As for the Givi and Oxford luggage, its quality is faultless. But I think I’ll try to make do with a tank bag in future all the same. Even the apron and muffs would probably be great if you were either a courier or a teenage girl in Barcelona who wanted to ride in a short skirt. I’m neither. The scooter itself has been as trusty as any bike I’ve owned. You just don’t have to worry about it. No chain means virtually no maintenance. Tyres that will easily last over 10,000 miles mean low servicing costs. Scooter leg shields mean no waterproofs. It’s the ultimate all-rounder. It gets you to your destination unruffled whether it’s five or 500 miles away – more than I’d say about the unfaired Funduro after a 100-mile motorway trip. But will I still talk about it in 10 years like I will about the Aprilia Falco I owned before it? Probably not. I guess in an ideal world I’d have both, but my salary prohibits that. That’s why, if you haven’t guessed, I’m selling the Tmax. The ad appeared in last week’s MCN, with an asking price of £3800 for a quick sale. I just hope I find a buyer who’ll appreciate the Tmax the way it deserves.